We have a great opportunity in front of us. The federal government has commissioned the production of an exceptional document, the Review of Federal Support for Fundamental Science, also known as the Naylor report, which gives a very clear assessment of the funding situation in this country. The Advisory Panel of the review, a blue-ribbon group of outstanding reputation, composed of highly respected scientists (including a Nobel laureate), top administrators and industry representatives, has formulated thoughtful recommendations. It is now time to Support the Report, and implement its recommendations. From 2006-2007 to 2013-2014, the Science review panel estimates that scholars, scientists and trainees wishing to pursue fully independent research work saw a decline of available real resources per researcher of about 35 per cent. The Panel’s overall conclusion is that independent science and scholarly inquiry have been underfunded for much of the last decade, as the federal government has concentrated resources on innovation-facing and priority-driven programs. According to the OECD, Canada is now second to last in terms of investment in R & D (as percent of GDP), and the only G7 country in which this percentage is decreasing. Coordinated policies to achieve better equity and diversity outcomes in the allocation of research funding while sustaining excellence as the key decision-making criterion. More stable and reliable funding for infrastructure, including digital research infrastructure. Innovations and cures for disease, benefiting our entire society always start with fundamental research. 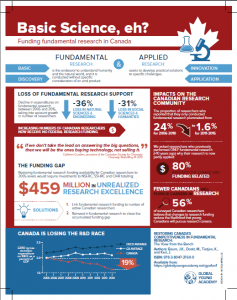 Fundamental research in Canada drives the discoveries that fuel an innovative economy. Reinvestment in fundamental science today is critical to maintain Canada’s hard-won reputation as a nation of scientific excellence, developed over its 150-year history. Science goes hand in hand with training of the highly qualified personnel that contribute to Canada’s innovation economy. It is an investment in the next generation of leaders required so that Canada can lead the world in the new knowledge-based economy. 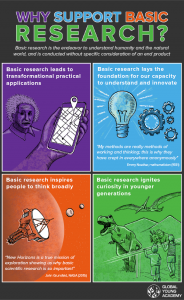 Research is how we understand the natural world and society, what problems we face, and develop the knowledge and tools to address them. Reinvigorating fundamental science would require investing a very small percentage of our GDP in the future of a highly educated workforce and fuel a discovery pipeline which is the bedrock of an innovative society.